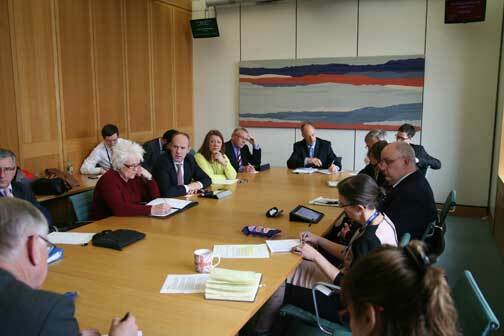 RTM meeting at Portcullis House. Clockwise from left: Rob Plumb, HML Holdings plc; Neil Maloney, IRPM; Paula Hassall, DCLG; (Sebastian O’Kelly, absent taking picture); Katherine O’Riordan, aide to Sir Peter Bottomley; Sir Peter Bottomley MP; Martin Boyd, LKP / Campaign against retirement leasehold exploitation; Nigel Wilkins, Campaign Against Residential Leasehold; Jim Fitzpatrick (obscured), MP Poplar and Limehouse; Cherry Jones, managing agent; Justin Tomlinson, Conservative MP Swindon North. The Westminster meeting on Tuesday March 11 on right to manage organized by Leasehold Knowledge Partnership / Campaign against retirement leasehold exploitation saw an all-party group on leasehold becoming more likely. The move would certainly be backed by Sir Peter Bottomley, Conservative Swindon MPs Justin Tomlinson and Robert Buckland, as well as Jim Fitzpatrick, Labour MP for Poplar and Limehouse, and perennial campaigner in the Lords, Baroness Gardner of Parkes. With an increasing number of MPs no longer falling for the self-interested obfuscations of the trade bodies, the voice of leaseholders is at last getting heard. Indeed, Lord (Richard) Best, a veteran social housing expert, is attempting something similar to an all-party group in the upper house. RTM meeting Portcullis House. Clockwise from left: Sir Peter Bottomley MP; Jim Fitzpatrick, Labour MP Poplar and Limehouse; Cherry Jones, managing agent; Justin Tomlinson, Conservative MP Swindon North; Karen Peel, leasehold activist; Dudley Joiner, Right To Manage Federation; Keith Edgar, Association of Retirement Housing Managers; Stuart Gardner, aide to Mark Field Conservative MP for Cities of London and Westminster; Rob Plumb, HML Holdings plc; (obscured) Mark McLaren, Which? 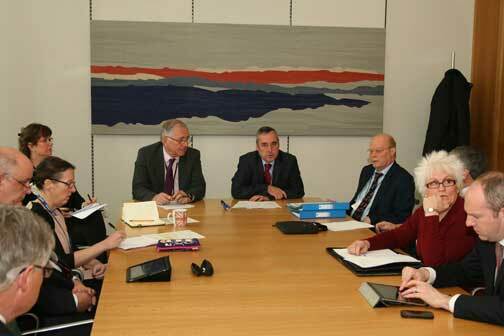 ; Neil Maloney, IRPM; Paula Hassall, DCLG; Katherine O’Riordan, aide to Sir Peter Bottomley. The Westminster meeting was a clear and unambiguous engagement with leasehold opinion, hosted at last by a leaseholder group. Opinions were sought from all sides, although Sir Peter Bottomley expressed his regret that the Leasehold Advisory Service did not accept an invitation to attend the meeting. This was a surprising absence as Sir Peter attended its annual conference last year, and has even visited LEASE’s offices to meet the staff, whose work he praises. Mark Field, Conservative MP for Cities of London and Westminster, was in China but represented by his aide Stuart Gardner. Field has more leaseholders than any other MP. Also present was perennial campaigner in the Lords, Baroness Gardner of Parkes. There was also a civil servant from the DCLG present as an observer. Shula Rich, representing the Federation of Private Residents’ Associations. Dudley Joiner, of the Right To Manage Federation, which has achieved right to manage for numerous sites, particularly in retirement leasehold. Mark McLaren, from Which?, had a broad interest in consumer interests in leasehold. The Institute of Residential Property Managers was represented by chartered surveyor Neil Maloney. Keith Edgar, the former head of Peverel Retirement, represented The Association of Retirement Housing Managers. The meeting lasted only an hour and gave quick-fire impression of issues in leasehold – not solely right to manage – by people actually involved in them. Euphemisms and the obfuscations beloved of the trade bodies in this sector were not adopted. Justin Tomlinson, MP for North Swindon, expressed his frustration that leaseholders’ right to manage can be thwarted on trivial grounds by practiced monetisers. He and Robert Buckland (Swindon South) have been backing independent managing agent Cherry Jones in her battles with Countrywide property management. She gave a forthright account of these, and expressed her disdain for practices in the sector. Like many other independent managing agents disgusted with the sector, she refuses to join any professional association where the views of those who play the system predominate. What makes her account so persuasive is that she, like Rob Plumb, is a managing agent. Rob Plumb addressed the 25 per cent commercial property limit, above which right to manage cannot be achieved. Karen Peel spoke eloquently of how she had tracked down 133 leasehold owners, mainly investors scattered around the world, to achieve right to manage of her site in Wakefield. Karen has helped several other sites to achieve right to manage. There was discussion on how freeholders, or managing agents could be compelled to hand over contact details of leaseholders. Sebastian O’Kelly noted that the Institute of Residential Property Management had informed the Office of Fair Trading of “the dangers of coercion within the Retirement Housing Sector” to obtain right to manage. This is a claim in its submission to the inquiry into leasehold management. As chairman of Campaign against retirement leasehold exploitation, O’Kelly said he had only encountered self-interested allegations of coercion from freeholders Vincent Tchenguiz and Israel Moskovitz, both of whose companies figure in numerous tribunal cases. “These allegations should be filed in the bin,” he said. Dudley Joiner, of the RTMF, emphasized the importance of professional management that face residents who opt for right to manage. O’Kelly cautioned Baroness Gardner against highlighting relatively minor problems among neighbours in the right to manage process: they are exaggerated by the vested interests in leasehold, the trade bodies and the IRPM. Of more relevance was that freeholders are prepared to take cases to the Court of Appeal to frustrate and or simply to delay right to manage applications. Often these objections are on trifling grounds, and freeholders now routinely deploy barristers to thwart right to manage. It was regretted that FTT chairmen are allowing appeals against RTMs on minor grounds. Shula Rich, representing the Federation of Private Residents’ Associations, addressed other means by which right to manage can be opposed concerning common parts and responsibilities. She is to write further on these issues on the LKP website. Mark McLaren, of Which?, suggested that the housing minister set up a working group to keep an overview of leasehold in the same way one does for the private rented sector. Well done to the organisers. They say daylight is a great disinfectant and this intrusion of daylight upon some of the abuses in leasehold are welcome. I hope the group heard about the abuse of the data protection action to prevent leaseholders getting contact details of other leaseholders and which they need for forming recognised residents’ associations. They are statutorily entitled to the information but may not know this and advantage of this has been taken by Peverel in particular. The same company has also been known to demand signatures and proof of payment of subscriptions by residents’ association members. It has no statutory entitlement to demand either. Needless to say, Peverel reported to the London Assembly that it “supports the formation of residents’ associations”. In my experience this is simply the opposite of the truth. I would like to hear of a SINGLE residents’ association supporting that assertion. I can name many that would describe it as completely bogus. What in fact is happening is that the trade associations/landlords/managing agents/legal profession are putting the spin on this to suit their own ends. Step by excruciating step we will get there! This time the crooked Freeholders and managing agents know it! I’d like to add a few words: I’ve been badly treated for many years by several of these management companies, with demands for money and threats issued in the same notice. These are all symptomatic of a section of the service industry that is about extortion rather than professionalism. I am thoroughly sick of being treated this way, and it is way way past time that the government copped on to itself and got its act together. I’d like to express a special word of gratitude to Karen Peel, in Wakefield, who has been almost single-handedly been instrumental in getting the leaseholders in a development in Wakefield where they are today. Rob Plumb, as former CEO at Hercules, the (London) villain of the industry before Peveral etc got into their stride, knows very well exactly how the sector is exploited. It is to his eternal credit that the culture of HML is night and day to that and while still running a business, can do so in a transparent and fair way. Very disappointing, but hardly surprising, that LEASE did not participate. All the more so, since it is paid for by the taxpayer (although it seems to have made a habit of encouraging the very companies that cause leaseholders problems, to sponsor its past conferences). This quango needs to be shut down, and a truly independent voice of the leaseholder should be given its funding instead. Leasehold will only increase, offering even richer pickings for the rip-off freeholders and their stooge agents and solicitors. Lots of votes for the party that chooses to champion leaseholders. I have worked with Karen Peel on several RTMs. We need many more like her. Would have been nice if my name had been spelt correctly! Well done to all at LKP, in a corrupt world as the one we live in today it’s encouraging to know that some are still upright and doing it out of the goodness of their hearts’. I now feel the epidemic of deceit, corruption and downright fraud is being addressed… slowly but surely we will get there; LKP and Campaign against retirement leasehold exploitation are the main reason.